Water-based, archival safe, acid-free, and non-toxic. The liquid itself is also tinted/dyed so it's not just colored glitter and water. You only need a fine mist to get the glimmer on your projects. You have to shake it really well each time to get mix-it up but there is no mess or clumps. There are 50 colors to choose from. 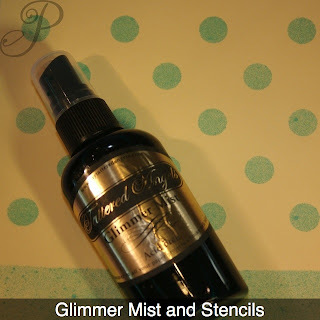 So, there are couple things you do need to know about Glimmer Mist. Because it is water-based, you need to use heavy-weight paper or will need to flatten your paper since it could buckle depending on how much Glimmer Mist you spray on your papers. You can control the intensity of the shades based on how much you spray or if you use several bottles to achieve shades of color. You can also use a heat gun to speed up drying time and set the Glimmer the Mist. I played with some bottles the other day to see what a little Glimmer Mist would do to different papers so here are the results. It really is hard to capture the results on film but you'll get the idea and come up with your own ways to use Glimmer Mist. 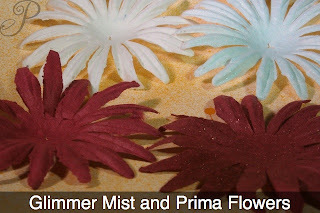 Glimmer Mist on Prima Flowers: How cool is that to spritz a little Glimmer Mist on some Prima Flowers and freshen up some old favorites. Or spritz some on white Prima's for color and glimmer. The flower on the left was what I started with and the flowers on the right are what they look like after the Glimmer Mist was sprayed on. 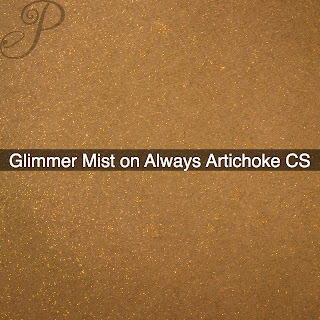 Glimmer Mist on Cardstock: Here is a close-up of Glimmer Mist on Always Artichoke cardstock. The weight of SU cardstock is great for Glimmer Mist. It really shows up on dark colors. 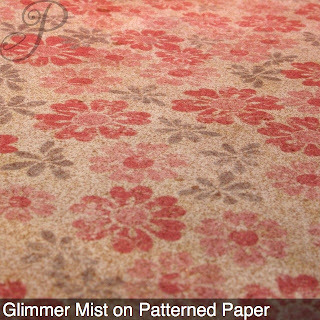 Glimmer Mist on patterned paper: To really add some subtle dimension, try spritzing a little on some patterned paper. If you are like me, you have some bits and pieces of patterned paper lying around that really needs to be revived. The Glimmer Mist gives these patterned papers an antique feel to it. 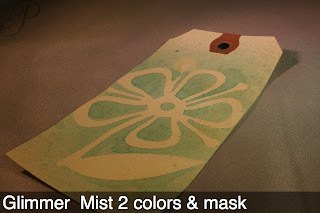 Check out Lisa Zappa's blog entry where she made a card using the Glimmer mist on patterned paper. 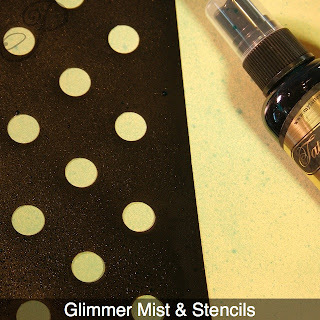 Glimmer Mist and stencils: You have a bunch of stencils lying around? I used a Heidi Swapp Mask(which we are getting) to make my own patterned paper. It's very hard to photograph but the subtle shimmer on the circles is pretty fun. You can make your own stencil shapes by using all those punches you have. The photo of the tag was made using one of the Heidi Swapp masks on a manila tag. I sprayed it with one color of Glimmer Mist to cover the tag. Then lightly sprayed some Harvest Orange Glimmer mist. I also tried a couple different bottles and sprayed all of them on white and vanilla cardstock with varying results. It was like making my own patterned paper. 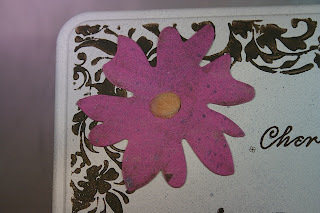 I figured that I could cut it into mats and or use my punches for some fun embellishments. 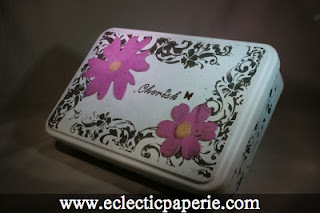 Finally, I used some Glimmer Mist on some painted chipboard and a metal tin. This is a Provo Craft tin that took the Glimmer mist well. I really like how it left that "flecked" look on the tin. It looks like when you use an old toothbrush to flick some paint on a project, but with a little sparkle, too. I tried the Glimmer Mist on a metal DVD tin but it just beaded up on the metal. I tried it on some ribbon but because it is water-based, it did not take to the ribbon. Finally, it does take a little practice as there is a slight learning curve to using it. I think that it also depends on what kind of surface you decide to spray on. A good tip that someone shared was to use a cardboard box(like an old box that was shipped to you) and put the papers in them(Thanks for that tip, GIRLS) to spray. I then learned to mist/spray once like a test spray before I actually sprayed the paper or project that I wanted the Glimmer Mist on. Use a heat gun if you want to speed up the sparkle and glimmer. There are so many possibilities. Think of all the holiday projects that could use a little extra glimmer and sparkle?